We're back in Canada after a two week Christmas visit with my family in Sweden. It was a fantastic trip with relatively mild winter weather (warmer than the -20C we had during our Christmas-visit two years ago), meaning we could actually get out and play in the snow without too much pain and suffering. There wasn't much snow, but there was enough for a sleigh ride and tobogganing, and that was enough for me! 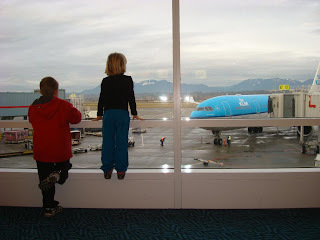 As nice as the trip was, I will also remember it as the first time my family missed a connecting flight. Considering how often we've travelled, I guess that makes us very fortunate. But it was a definite reminder that you can never be sure about anything when you're flying. The missed flight happened on the way to Sweden. We had about a 3 hour wait in Amsterdam between the arrival of our flight from Vancouver and the departure of our flight to Stockholm. 3 hours in an airport with two tired kids is a long time, but the children were doing alright. All of a sudden the cloudy skies outside turned black, there were thunder claps in the distance and a flash of lightning. Then it started hailing. The kids were freaked out and excited at the same time. So was I, and at the back of my mind I thought "I have a bad feeling about this". The hail and thunder only lasted 15 minutes, but this was our undoing. We originally had about an hour and a half in Stockholm to catch our last flight of the day, the one taking us from Stockholm to Skellefteå in northern Sweden. This is usually enough time with some margin. But not this day. Apparently airport ground crews can't work on the tarmac when there's a thunder storm. So our plane could not be fuelled and the luggage could not be loaded on time. Makes sense of course. Fuel, airplanes, people on wet tarmac, and lightning probably do not mix. The hail meant our plane had to be de-iced once everyone had finally boarded. Now, apparently there is only one de-icing station at Schiphol, probably because they don't get a lot of snow and ice and freak hail. It took, literally half an hour for the plane to get to the de-icing station. Then more time for de-icing. We left Amsterdam an hour late. Once we reached Stockholm it was late in the day and we had been traveling for 20 hours straight. We now only had about 20 minutes to clear our luggage through customs and hustle through Arlanda Airport to our next flight. Not great odds, but we thought we might squeak by if we were lucky. We waited at the luggage carousel while the boarding time for our last Swedish flight crept closer. The kids were restless by now, and so was I! Then it was announced that due to a technical problem, our luggage would be delayed a further 20 minutes. Which meant the gate for our flight had closed by the time we got through customs. We still hustled over to terminal 4, just in case a miracle would occur, but there was no miracle. Gate closed. Spend the night at the airport and try to get on a flight the next day. Try to catch an overnight bus to Skellefteå (about a 10 hour journey). Get on a flight to an airport close to our ultimate destination and then take a bus or cab to Skellefteå. None of these options seemed attractive, but my husband and I agreed that we wanted to arrive that day, even if it took us until midnight. By this time I had already contacted my parents to tell them we'd missed our flight. They helped us book a flight to Umeå, located about 140 km from Skellefteå. Unfortunately the bus that usually goes from Umeå to where my parents live was not in service that day. Just our luck. In the end, we flew to Umeå and then caught a very expensive cab from that airport, arriving at about midnight, 4 hours after our scheduled arrival. And that's how 15 minutes of hail turned into 4 hours of delay. Flying in winter-time can be dicey. Flight delays can occur any time, for many different reasons. However, there is an increased risk of flight-delaying weather in winter. For example, if de-icing is needed, it can really slow things down at many airports. More transfer time means less stress but more boredom. Allowing for more time, say 2+ hours, between connecting flights can help avoid these kinds of problems. However, that also increases the time spent waiting in airports with the kids, and that's not a lot of fun either. Re-booking can cost you. Airlines don't automatically re-book you if you miss their flight because of another airline's delay. I already knew this, but it's something that is important to remember, especially since it might cost you. It is possible to try to get the delay-causing airline to reimburse you, but it's not a sure thing and it will take time. Stressing out doesn't help. Worrying about whether you will make it to the next flight or not helps increase your stress level, but does not actually help you catch the next flight. I did try to remember this as we sat on the tarmac in Amsterdam, and as we hustled through Arlanda airport. It's almost impossible not to stress about it, but I did at least try not to completely freak out. Taking a break is good. A bathroom visit, a snack and something to drink really helped calm us all down as we settled in to wait for our last flight of the day. 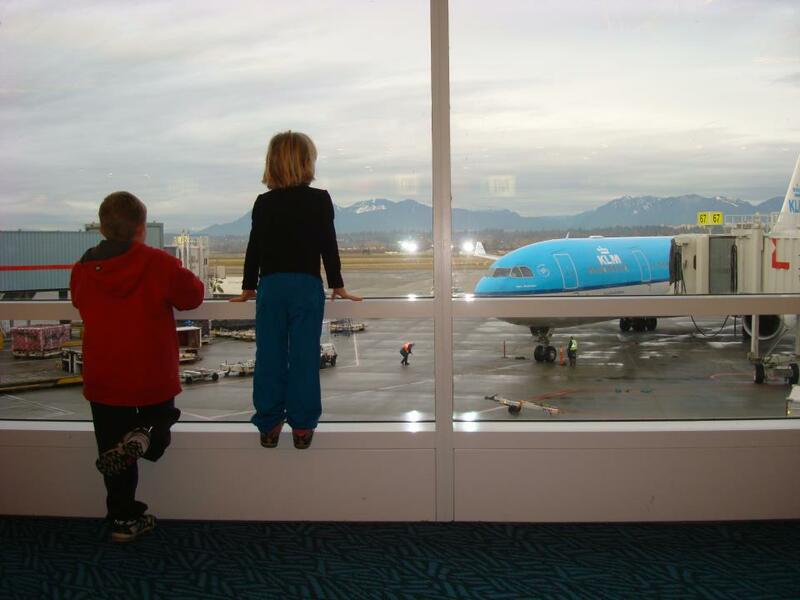 Reading a book and watching the planes helped too. I sympathise with your ordeal. We once missed a connecting flight from Cairo to Rome. It was probably the worst travel experience we have ever had. Egypt Air cancelled our original flight to Cairo and didn't bother to contact us but when we finally arrived in Cairo too late to get our connection to Rome they did nothing to help us. We were left to fend for ourselves late on a Thursday afternoon knowing that nothing opens in Cairo on a Friday. Yikes! That is a very bad travel experience! I know I usually assume that airlines will take some responsibility and help you out, but often they won't do anything. Makes for a good story later on, but not so great when it's happening!